Hello, I have a problem on front-end product page. and this problem only happened in Quantity input method: "Show select"
This problem just happen on one website that I managed, the other site I use hikashop is fine. So, I was wondering where and how to check and fix the problem. A product have characteristic for select and the Quantity select is " 2,4,6,8". I have to set quantity in every variants, could it possible that I just need to set the in product? Last edit: 1 year 3 weeks ago by rakuzen. 1. Hard to say without looking at the issue on the page. Could you provide a link to such page ? Please make sure you include a link to this thread in your message. 2. Again, we would need a link to such product. Also please provide a screenshot of the settings of that product (and the default variant) so that we can analyze the situation. About the "Question 2. " Last edit: 1 year 3 weeks ago by Philip. I process some tests on your website, and wasn't able to reproduce your first issue... In any case, I was able to select the quantity. => Can you give a step by step process to see by ourself the issue ? Precise as well with which navigator do you use ? For the second point, the variant quantity as to be set, like the main product in order to restrict quantity selection. HELLO~ About first issue, I just send the mail. Have you receive the e-mail? If yes,please reply to me, thank you. As ask previously can describe a step by step procedure and precise your navigator. Last edit: 1 year 2 weeks ago by Philip. 1) Go to the product page. 2) Select the second type of the product characteristic. 3) Then select quantity value click the drop-down. It can't show the drop-down menu to choose more quantity. I was able to reproduce the issue and added a patch on our end. You can download the install package on our website in the menu My account>My subscriptions and install it again on your website to get the patch for that. I installed the package, but The issue still exists. And finally, I found the "Display" > "General display options" > "Use Chosen library" cause the issue. When I switch to "NO" then select the "characteristic value" the "quantity value" can be chose. Any way, thank you very much for your kind assistance. (quantity is "Show select" ) And I suppose it is related with chosen library. Please provide a link to the product page with the issue so that we can assess the situation. So the issue comes from the specificities of three different parts. The issue with the characteristic might be similar to that other thread, but it might be something else. Hard to say without looking at the page as we don't have the issue on our end. Another point, when you use the Contact us form please add an url link to this topic in order to keep the link. Last edit: 6 months 2 weeks ago by Philip. To fix that, you could turn off chosen, or alternatively, you could add CSS to force the size of the dropdown. Make sure tht you put in the CSS of your template. 2. The order of display of the characteristic values doesn't necessarily depends on the order of the variants in the backend or whether a value is used for the default variant or not. 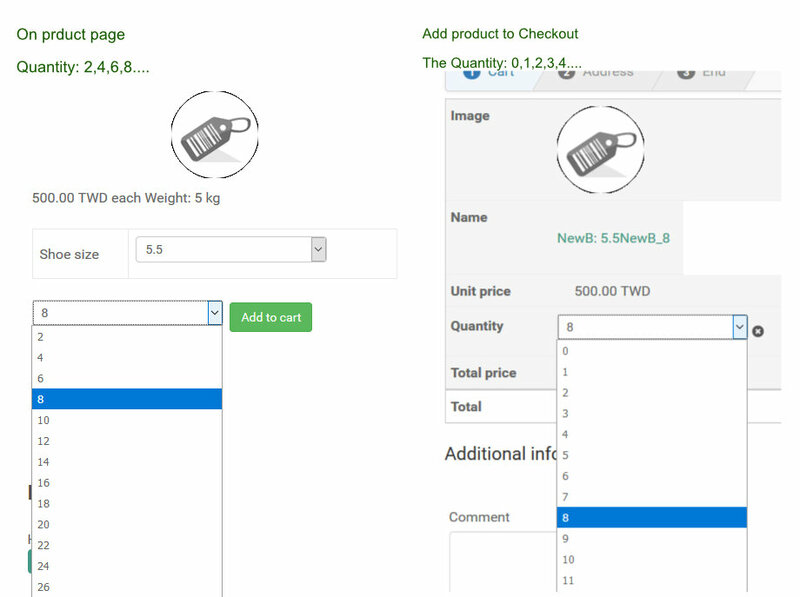 The order depends first on how you configured the "Characteristics values ordering" setting in the hikashop configuration. If you selected "ordering" in that setting, like it is by default, the ordering depends on the numbers you entered in the input fields of the order column of the values listing of the characteristics via the menu Products>Characteristics. So you want to check that. 3. For the warning on the HikaMarket payment interface, you can turn off the HikaShop payment common plugin via the Joomla plugins manager as you probably don't use it. We'll add the fix for it in the next version of HikaMarket.